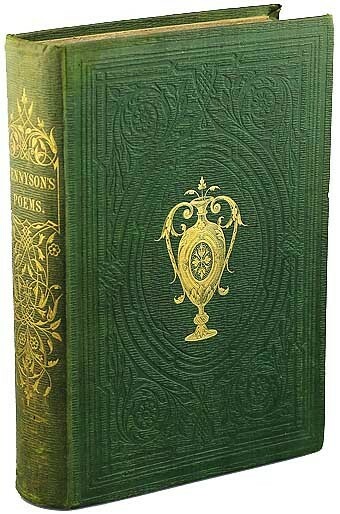 Binding from Poems by Alfred Tennyson/ London, UK: E. Moxon, 1857. 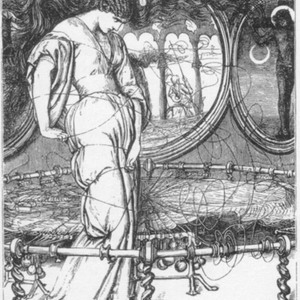 This passage makes apparent Rossetti’s desire not to just support the poet’s narrative, but to create an allegorical illustration that functions separately from the text as well. 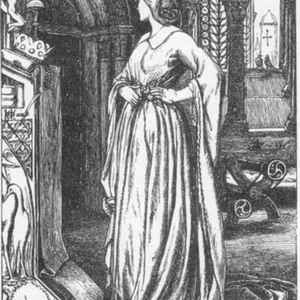 In this respect, Pre-Raphaelite illustrations go beyond depicting an episode from a poem, but rather function like subject paintings within a text. The illustration is not subservient to text and vice-versa. Careful and conscientious craftsmanship is practiced in every aspect of production, and each element, though qualifiedly artistic in its own right, contributes to a unified art object (the book). Though seemingly distinct, various forms of Victorian media incorporated each other into their representation. The Moxon Tennyson is a sum of its individual parts, and the layers to its embodiment relate to its various collaborators. The growing middle class created an increased demand for domesticated art—the wood-engraved book —and in the case of the Moxon Tennyson, it proved to be a safe access point to the Pre-Raphaelites and the range of media with which they practiced. The publication combines utility and ornament, and its poetic and illustrative messages penetrate the body through visual and tactile means. 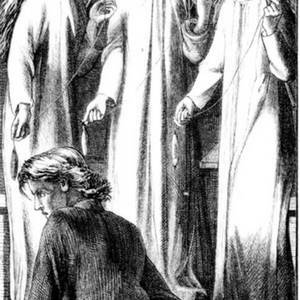 The Moxon Tennyson encapsulates many facets of Pre-Raphaelite artistic practice, from collaboration to philosophical approaches, and the multi-sensory engagement of the book itself parallels the Pre-Raphaelite idea of embodiment through art. There is continuity between this earlier Pre-Raphaelite project and William Morris’ Kelmscott Press, as well as Rossetti's poet-illustrator collaboration with his sister Christina (Goblin Market, 1862 and The Prince's Progress, 1866). 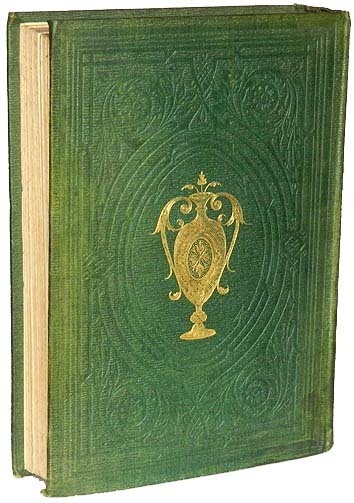 Notably, Morris also had similar sensory considerations in the book designs of his press and his furnishing and decorative arts company, Morris & Company. 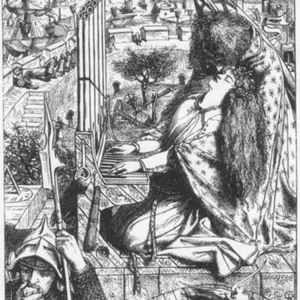 The Palace of Art, Dante Gabriel Rossetti from Poems by Alfred Tennyson. London, UK: E. Moxon, 1857. 1. Lorraine Janzen Kooistra, Poetry, Pictures, and Popular Publishing: The Illustrated Gift Book and Victorian Visual Culture 1855-1875 (Athens, OH: Ohio University Press, 2011), 37. 4. 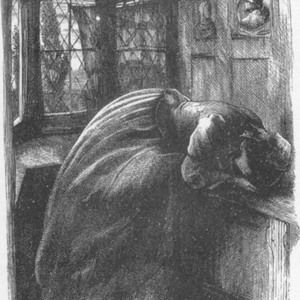 Laurence Housman, Arthur Boyd Houghton: A Selection from his Work in Black and White, (London, UK: Trubner and co., 1896), 13, as quoted in Kooistra, Popular Publishing, 43. 5. Kooistra, Popular Publishing, 43. 6. Letter from D.G. Rossetti to William Allingham as quoted in Dennis Welland, The Pre-Raphaelites in Literature and Art (London, UK: George G. Harrap & Co. Ltd., 1953), 17. 7. Colette Colligan and Margaret Linley, eds., Media, Technology and Literature in the Nineteenth Century, (Burlington, VT: Ashgate, 2011), 107.